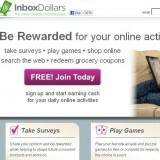 Inbox Dollars, found at inboxdollars.com and owned by Cotter Web, is a bit more than just an online paid surveys site. At Inbox Dollars you can earn money by not only taking surveys, but also by reading email, shopping online, product testing, and playing online games. It’s more like an online rewards club that is free to join. Inbox Dollars pays you 1 to 10 cents to read a few advertisement emails they send you per day and even get paid to interact with the ad. It’s also like an online shopping club as well. You get paid a little bit more when you take their surveys. How it works is the research company pays Inbox Dollars and Inbox Dollars pays you to complete the survey. You can also get paid to shop, and search the internet. Unfortunately, you have to spend money to get a small percentage back on what you pay. Inbox Dollars makes their money by having you sign up with their partners including eBay and Stamps. You earn 6 dollars to sign up and make a bid on eBay while “Inbox Dollars” makes about thirty dollars off you. They make fifty dollars if you take Stamps free trial while you make 10. If you don’t cancel the free trial you will be charged sixteen dollars monthly while Inbox Dollars makes fifty every month you are charged. I usually see a few complaints here and there about most companies. However, I was astounded by the amount of rip off reports, complaints comments and other just over all bad reviews that I believe Inbox Dollars should be considered a scam if it weren’t free. Yet since it is free to become a member, you are taking your chances of getting spammed by this company and their ad partners and affiliates for, what a couple of cents per email you read? Although there are a few users of this service out there who might swear by this site, there are enough horror stories of people not getting paid the credits for work done, and of customer service nightmares to warrant a strong warning to completely avoid ‘Inbox Dollars’. Does this sound like something worthwhile to me? Of course not.